In the U.S., fireworks are synonymous with Independence day. Yet for all the fun of fireworks, they can also bring burns, blindness and even death. Follow-up investigations of incidents showed that most injuries were associated with malfunctioning fireworks, such as unexpected flight paths or dangerous debris, or improper use, such as lighting fireworks too close to someone or playing with lit or used fireworks. The take-home message: if you’re playing with fireworks, you’re literally playing with fire. You can see the rest of the data from the CPSC report in the infographic below. 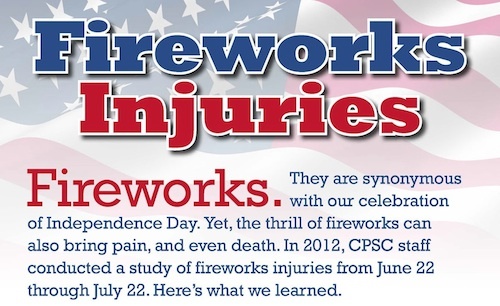 New CPSC Data Shows 60% of All Fireworks Injuries Occur Around July 4th; Firecrackers, Aerials, Homemade Explosives Cause Most Deaths, Injuries. United States Consumer Product Safety Commission. 2013 Jun 26. Walter Jessen is a senior writer for Highlight HEALTH Media.